Learn the minimally invasive technique of Prostatic Artery Embolization (PAE). The course will feature taped cases, tips for microcatheter manipulation through difficult anatomy from different access points (transradial and femoral), and hands-on training. The course is led by leading experts in PAE. Access this center for PAE resources including procedure guides, studies, and patient awareness tools. 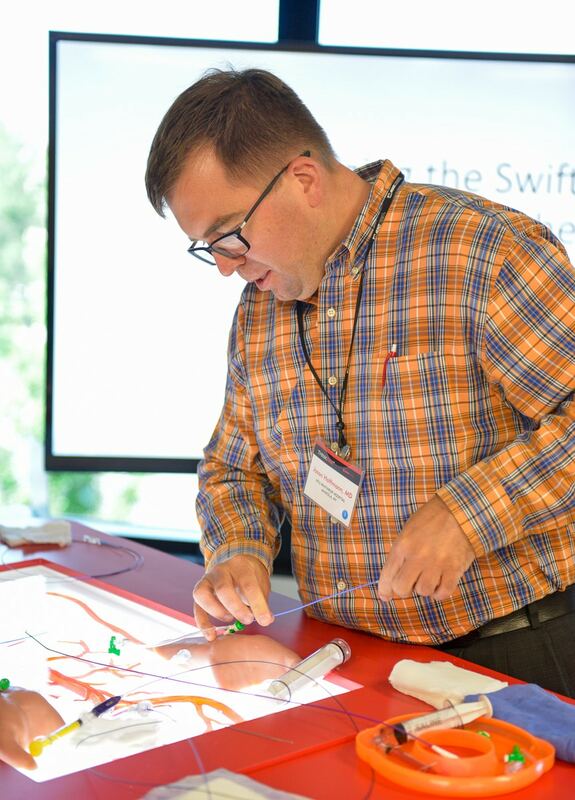 This course is designed for Interventional Radiologists who have the clinical capacity to perform PAE, and who want to gain thorough knowledge about all aspects of the procedure, from patient work-up to post-PAE care. It is required to have cone beam CT imaging access to ensure the imaging equipment is suited for PAE. A minimum of one embolization procedure per week (no fewer than 52 embolizations annually) is strongly recommended. It is helpful for attending Interventional Radiologists to have a good working relationship with their facility’s Urology Department, in order to collaborate on patient selection and treatment. Dr. Shivank Bhatia is an Associate Professor of Interventional Radiology and Urology at the University of Miami Miller School of Medicine. Dr. Bhatia is one of the early adopters of PAE in US, and he served as a PI for the highest enrolling site for the BEST study. He received an SIR foundation grant to investigate the role of PAE in prostate cancer, and he has studied PAE for a variety of indications like BPH, including for patients who had recurrent symptoms after surgical treatments and those who had giant prostates, prostate cancer, hematuria and urinary retention. He has published over 10 manuscripts and has delivered more than 25 invited lectures on topics related to PAE. Having performed over 270 PAE procedures, Dr. Bhatia is one of the Interventional Radiologists most experienced in this procedure in the country. Dr. Bhatia has built a multidisciplinary program for PAE with the Department of Urology at University of Miami. Due to his significant collaboration with the Urology Department at University of Miami, he was awarded title of Associate Professor of Urology in 2015. Dr. Kava is a Professor and Director of Men’s Health at the University of Miami Miller School of Medicine Department of Urology and Chief of Urology at the Miami Veterans Affairs Medical Center. He has a Master’s in Science Degree in Clinical and Translational Research Investigation and is currently serving on the Board of Directors for the American Society of Men’s Health. Dr. Kava is internationally recognized for work that he has done in improving healthcare provider communication skills for the American Urological Association and the Sexual Medicine Society of North America. He has an active clinical and surgical practice in South Florida, and is affiliated with multiple hospitals and offices in the Miami, Broward, and Palm Beach areas. 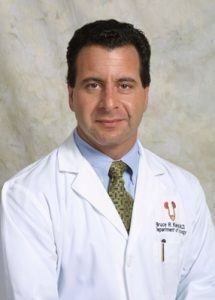 His research and clinical interests include urologic oncology, men’s health and male sexual dysfunction. As a specialist in male sexual disorders, Dr. Kava supports prostatic artery embolization (PAE) as a non-surgical option that treats select patients with symptoms related to benign prostatic hyperplasia (BPH) and desiring preservation of erectile and ejaculatory function. Dr. Kava is currently developing a multidisciplinary men’s health center that will advance the treatment of post-oncologic sexual health issues across the country and serve as a model for other men’s centers regionally and throughout the US. Dr. Hoffmann graduated from the State University of New York at Buffalo School of Medicine and Biomedical Sciences in 2004. He completed his fellowship in Interventional Radiology at the Hospital of the University of Pennsylvania, and currently is an attending physician and Director of the Diagnostic Radiology Residency Program at NYU Winthrop Hospital in New York. In addition, he serves as the Director of Interventional Radiology Education at his institution. Dr. Hoffmann performs a wide variety of interventional radiology procedures. While his main focus over the past 7 years has been developing interventional oncology and women’s health programs, he has also had success building a prostate artery embolization program with strong collaboration with his urologic colleagues. A dedicated educator and mentor, he has won the Department of Radiology “Attending of the Year” award two times at NYU Winthrop in the past five years. 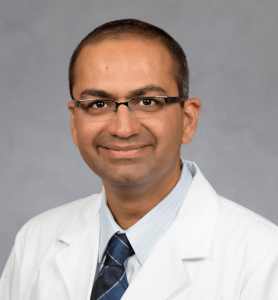 His research interests include radiation safety in the Interventional Radiology suite, cryoablation, transarterial embolization outcomes, the role of prostatic artery embolization in prostate cancer, and development of mentorship programs.